How will Archbishop Rowan Williams react, to the growing support for a racist antisemite who believes in the blood libel, in the Church of England? 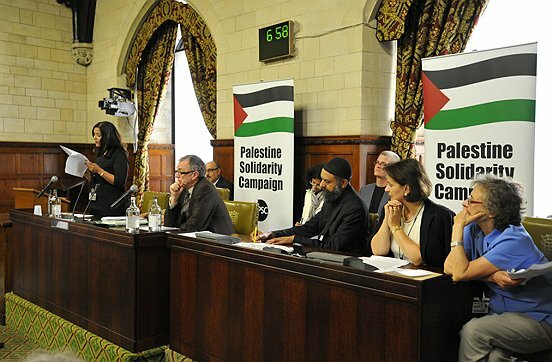 In late June, the houses of Parliament hosted a “Save Jerusalem Campaign“, with Raed Salah scheduled as the guest speaker. The event was afforded much credibility, due to its venue, and also due to the fact that several Labour MPs were in support. Reverend Dr Stephen Sizer, a director of the Amos Trust, was Raed Salah’s official photographer in London. Amos Trust director and founder, Garth Hewitt was in attendance. Garth Hewitt is the canon of St. George’s Church in Jerusalem, and he thinks anti-Zionist Jews are like Biblical prophets. The “Save Jerusalem” event was supposed to host Sheikh Raed Salah, the racist, extremist hate preacher who funds Hamas. The arrest appears to be the result of an orchestrated libellous campaign in the right-wing, pro-Israel media and bears all the marks of a political rather than a legal measure to curb freedom of speech. The arrest of such a high-profile and well-respected Palestinian leader will, inevitably, damage relations between the Muslim community and other sections of British society. Sheikh Salah is renowned for his non-violent approach to the protection of Palestinian rights in Israel and the occupied Palestinian territories. Home Secretary Theresa May has clearly succumbed to pressure from the pro-Israel Lobby in Britain to prevent Sh. Salah from being able to give a first-hand account of the discrimination faced by the so-called “Israeli-Arab” community; Israel’s Palestinian citizens who constitute 20% of the total population in the state. Rather than condemning Salah’s blood libel, the Amos Trust teamed up with Raed Salah, portraying him as a man who will help to save Jerusalem. By signing this letter, the Amos Trust framed the arrest of Raed Salah, essentially as a Jewish conspiracy against a peace-loving man. Stephen Sizer of the Amos Trust then paid Salah a visit, along with his congregant Tony Gratrex – who oversees Reading PSC and thinks the Jews control the media. Yet the Amos Trust’s campaigning on Palestine has widespread backing in the church. The Amos Trust counts, among the organisations pledging support, the Methodist Church, the World Council of Churches, and two Anglican missions: The Church Mission Society (CMS), and USPG: Anglicans in World Mission. Anglican churches across England raise money for CMS and USPG. Furthermore, Archbishop Rowan Williams is the Patron of CMS and the President of USPG. Thankfully, the Archbishop clearly condemns the blood libel. “If the stories are not told over and again, we lose the memory of those who suffered and we risk losing something that protects our humanity,” he said. Having recognised the terrible evil of the blood libel, Rowan Williams must persuade his mission charities to rescind their endorsement of the Amos Trust.